For many men, health and wellness often takes a back seat to climbing the corporate ladder and family life, but a 24-hour road trip from Florida to New York is the platform two doctors are using to encourage men to make health a priority. 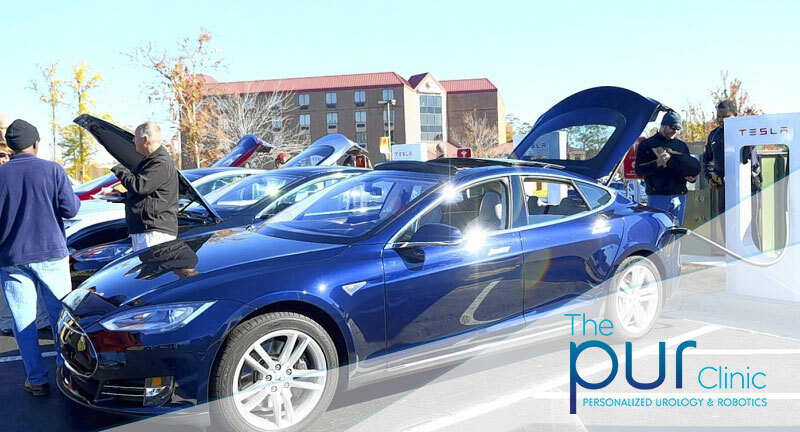 The doctors will stop along the way to charge their all-electric Tesla S in East Coast cities – including Rocky Mount – and talk with local people about men’s health issues. Parekattil and Dr. Jamin Brahmbhatt will take to the road Thursday morning in central Florida and make their way up the coast, using Google Glass and Go-Pro cameras for web-broadcast discussions of men’s health issues with national physicians while on the road. Every 150 or 200 miles, the doctors will stop for public rallies about various issues ranging from enlarged prostates and low testosterone to cancer detection and treatment. Dr. Cary N. Robertson of Duke University Health will discuss testicular cancer with the Florida physicians at the Rocky Mount stop. Gateway Centre Marketing Director David Joyner said he is proud that Rocky Mount is the second of two North Carolina stops. Statistics from the N.C. Central Cancer Registry indicate that between 2004 and 2008, Eastern North Carolina had a seven percent higher rate of cancer compared to the rest of the state. With a higher percentage of the population living below the poverty level, preventive health screenings can be difficult to afford, but medical officials state that such proactive medical care can make a tremendous difference when it comes to the mortality of cancer and other serious diagnosis. Read the entire article on Rocky Mount Telegram.